I’m delighted to be partnering with the Certificate of Irish Heritage to bring you this wonderful giveaway. One lucky reader will win a gift card entitling them to one Certificate of Irish Heritage (certificate only, no frame). 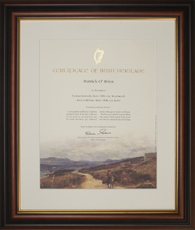 The certificate acts as a unique memento which honors the recipient’s ancestor(s) and symbolizes their connection to Ireland. The certificate would make a beautiful addition to your home and will be a great way to proudly show off your direct links to Ireland. You can read more information about the Certificate, and an interview with a certificate holder here. For this competition I would like you to tell us a little about the Irish ancestor you would honor on the certificate. Their name and a little about them will do. You can even choose from the list of pieces of information that the Irish government requires when you order your certificate. They ask for answers to 2 of any of the following questions about your Irish ancestor: the town or parish they came from, the year they were born, what year they left Ireland, their departure port, port of arrival, where they settled, or their occupation. Or, maybe you have a little story to tell about your Irish ancestor. We’d love to hear it. Use the comments section below to enter your details and you’ll be automatically entered into the drawing. Your entry must be received no later than Thursday May 30th. A winning entry will be chosen at random and notified by email and here on this post. Congratulations Julie. I hope the certificate acts as a wonderful tribute to your great-great-grandmother, Catherine Geraghty. Thank you to everyone who entered, and thank you the folks at the Irish Heritage Certifiate for sponsoring this giveaway. I would Honor my Great Grandfather, Thomas Gallagher, a proud Immigrant, a coal miner who gave his life along with his brother in the one of those black hell holes,Leaving an immigrant wife 1 son and seven daughters. Top o’ the morning to you all! I feel quite superior claiming my Irish roots as my beloved grandmother Gargie was born in the mother country. A proud, feisty, strong, courageous woman who came to Australia as a WW1 bride and never returned. She wanted to go home to visit, although Australia became her home and she loved it. While her loyalty certainly lay with her adopted country, her heart still lived in Ireland. She yearned to once more dip her feet in the Liffey river. She would have given her soul to hug her 12 brothers and sisters once more before they all went to meet St Patrick. She was the oldest of the siblings and outlived them all. I don’t think I’ll ever forget that overwhelming sadness in her eyes when she got news that the last of her siblings had passed away. The night before she left us to join them, I believe she astral travelled back to her beloved Limerick and said goodbye to the country that held her heart. I grew up with so many stories of Ireland that I always felt every bit as Irish as I do Australian. I know we do have other heritage as well, yet I definitely identify only with the Irish and Australian. When I was about 4 years old, someone gave Gargie a vinyl album…. Irish and Proud of it.. by Ruby Murray. Oh, that just cemented my love of all things Irish. I’m surprised it survived as I played it over and over and over. I still own that very copy of the album and have since purchased the same album on CD as it was a must have. Cockles and Mussels, Ruby Murray style, was, in fact, the very first song I ever sang publicly. It was my first year of Primary school and we had a junior grade assembly. All of grade prep, grade one, grade two and grade three. My teacher Miss Stewart chose me out of the grade to sing in front of the assembly. You’d think a 5 year old would find that daunting.. but not me.. Up I got, and belted out the song I knew as Alive Alive-O, even managing to put an echoey effect on the end like she did. I used to love to sit on Gargie’s bed with her (she was crippled with Arthritis so often bed bound) and listen to her sing Danny Boy. I still cannot hear that song without hearing her voice. I’ve heard hundreds of beautiful versions of it, but none compares with the beautiful, rich, deep dulcet tones of Gargie singing it to me. She made sure I knew both verses and could sing it perfectly. There was no mucking it up.. I had to do it justice. While I can sing a reasonable version of it, I am but a mere amateur when compared with her exquisiteness. She described the walks along the streets of Ireland, and I could close my eyes and easily imagine walking with her hand in hand, so vivid was the telling. When she described dipping her feet in the Liffey River in Dublin, I could feel the cold water lapping at my feet. As she described the green, patchwork fields, I was sitting on a hill with her, overlooking them. I walked the cobbled paths with her as she described the thatched cottages. I saw photos her family sent over through the years and they were so like our family to look at that I felt like I knew them already. She made me promise to go home for her. She wanted me to walk O’Connell Street and drink in my surroundings. She wanted me to dip my feet in the Liffey River. She even wanted me to kiss the Blarney Stone although she said I didn’t need any help in the “gab” department. She wanted me to see the Mountains of Mourne. I yearn to sit in an Irish Pub and listen to the music. I want to hear the stories told in the strong Irish brogue that I grew up listening to and so sorely miss. I want to be part of the Craic. I want to retrace her steps and imagine life as it was for her when she walked that path. I have to see Molly Malone’s statue and thank her for her song. I would dearly love to see Finbar Furey in concert in Ireland, and hear him sing “The first leaves of Autumn”, the song played at my daughter Aimee’s funeral. I am so determined to get there. But it’s much more than a want.. It’s a need. I absolutely yearn to go. I feel I will never be completely whole until I go there. I know there is something there that I need to experience to understand myself fully. I know it sounds crazy, but to me, it’s my spiritual home. I don’t know what it is, but deep in my soul, I just know it’s there. I’ve always known. Ireland holds a secret for me, I just don’t know exactly what it is. Until I go, I will never be complete. I think she wove a magic spell over me that made me incomplete until I get there. I know there is a pot of gold at the end of the rainbow for me… I just don’t exactly know what form it will take. I do know, the end of the rainbow is in Eire though. Australia is, and always will be home to me. I love this country with an indescribable passion and am so very proud to be an Aussie but Ireland is part of me and I need to visit. I need to learn the secret she has hidden there for me to find. And there is no doubt, the woman was a spell weaver…. spreading gold dust along the cobbled paths, luring me to walk them. She wove the magic of Eire so well, it is part of my psyche. I know when I do go, she will be skipping along the path beside me, welcoming me home and helping me find that missing piece of me. I also know that now it’s my time.. I have spent many years looking after other people. My choice completely but now I’m free of those responsibilities. Gargie lived with us from when I was just a kid, so I spent a lot of time fetching for her. I never minded at all. I helped Mum nurse her and she died when I was in my early teens. Mum and Dad came to live with me when I was only 26 and I helped Mum nurse Dad till he died a few years later. Again, I nursed Mum and held her in my arms as she passed away. Of course, I also raised my own kids in that time, through some of the hardest times imaginable. And I wouldn’t change it. It was a privilege to look after them all. They are the great loves of my life. They ARE my life. But now, it’s time to find the other part of me… the missing piece. I don’t know how I’m going to get there, but I know it’s so necessary that the universe will provide the means for me to go. 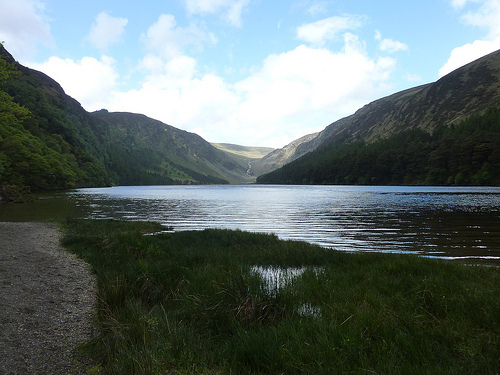 My heart is yearning to go home to a place I’ve never been….. Ireland. My spiritual home. I am so very excited about this! My grandmother turns 91 this year and her father was Irish. He died when she was about 5 and she has always been in love with Ireland. It was her great grandfather, Patrick Whalen, that came over from Ireland. I went to Ireland last year in hopes to find any relatives that we may have over there, but all we know is that his wife was from Co. Limerick and he was from Co. Tipperary. This would be such a lovely gift. It is a bit of a tough call whom I would choose. I have researched my great-grandparents extensively, and have a fair bit on my great-grandfather Michael Tierney working as a policeman over here in New York, but still nothing definitive on his origin in Ireland. I think after all I would have to choose my grandmother, May Egan (later Tierney) – through my own research and help from cousins connected with in Ireland and elsewhere, I have learned a bit more of her life than any of us knew before. By any measure she had a difficult time when young; losing her mother when a child, going to live with her grandmother, eventually having her own daughter while still young, resulting in her being sent to New York soon after. Her life here certainly had its rough spots as well, and the new information I’ve learned over the years has given me more respect and compassion for her. She was born in Creggan, Kings County (near Ferbane) in 1891, and emigrated to New York about 1909. Even after much trying, I have yet to find her on a ship and I now suspect she may have rowed over herself. My husband and I are “digging up” our Irish roots and would love a trip to Ireland in the future!! Please honor our families: Johnston from Omagh and Chichester (Chitester). Well…. IDK who I’d actually be able to honor…. I guess the whole Dilley name or even the Shinnaberry’s…. I don’t know much about our heritage other than it used to be O’Dilley until they came from Ireland to here. They had to drop the O because of the harsh way people treated them at the time. They wouldn’t hire irish workers then so the family had to make due. I have always dreamed about coming to Ireland one day though. I’ve heard there is a castle over there that is owned by the O’Dilley family (though that could be just family talking like they do.) and would love to see if that’s true! My dad was Patrick J Duggan. He was born in Falcarragh, county Donegal on 3/16/21. He came to the USA in 1950. My mother’s parents also came from co. Donegal- Manus Gallagher and Margaret Ward sometime in 1915. Margaret Ward was born in Brinlack. I am first generation Irish on my dad’s side and second generation on my mom’s side. I am so proud of my Irish ancestory. I was able to visit Ireland with my parents and stay in the Duggan Family Home in Falcarragh. It was great to meet my Irish family. I am now learning Gaelic and hope to visit Ireland again. My dad died in 1992. Eery year I visit his grave and leave a bit of Ireland for him- an Irish Flag, an Irish coin or a Shamrock to celebrate his life. I would honor my 6X Great Grandfather John Ross who was born 12 December, 1712 in Richill, County Armagh. He came to the U.S. with his family in 1751, arriving in Philadelphia where he worked as a tanner before purchasing his farm on the Cheat River where he remained until he died in 1776. My grandmother, Anne Doherty, was born in March 1910; I have an old article, with photos, about the school she went to, N.S. Fenagh and the photos show (Knockmullin) after her name, which I presume was the town she lived in. But, I do not know for sure. My grandmother died in 2004 and this certificate is not only to honor her, but a promise to myself to go to Ireland and find out more. I know that she came over to the States after WWII and that she was set to marry someone, but married my grandfather instead. They moved around quite a bit and had 5 kids. They eventually settled in California, which is where both of my grandparents are buried. My great-great-grandmother, Catherine Geraghty, from the village Ballinasloe, was not allowed to travel overseas with the man she was to marry on her 21st birthday. Her father felt he needed her at home to help care for her younger siblings. She found another local girl to marry her love, James Manion, and the two set off together. A year later, Catherine’s father, feeling guilty, accompanied his daughter and 3 other local girls on a trip intended for the U.S. While in Quebec, Catherine and James were reunited. James’ wife had died of “ship fever” the year before. And the rest, they say, is history! Catherine & James were married and had 12 children, one of which was Catherine who married George Emeri Gervais. George & Catherine would have 2 children, George Jr. and Jaunita Ann. George Jr. married Ester Morrata, and they had 3 sons, including my father! I never knew my paternal grandparents, they both passed long before I was born. I am so grateful, however for the family history that was documented. . .and I was finally fortunate enough to travel to Ireland in March of 2012 to see where it all began. We traveled through Ballinasloe, stopped for a bit, and imagined what it would have been like in 1847 when Catherine left. My tribute is to Catherine Geraghty Manion. I know more about my grandmother, Margaret Neary Delaney. She came from Castlebar, Mayo. My grandfather, William, I believe, came from Co. Offaly. She became a widow early and she worked to support three kids. I am still searching for relatives. I know I have cousins in Ireland. I would honor my father who recently passed at the young age of 96 – just shy of his 97th birthday. My Grandma hailed from the bowels of Limerick, left through Liverpool (where my Grandfather, her husband was born) and they arrived in Boston. They lived in Detroit, MI until my Grandfather passed away. Then they moved to Chicago where Grandma worked as a maid at the Stockyard Inn. It was a tough life for Grandma who worked hard, but managed to raise a fine young man in my Father.